So have you ever put a good amount of time into doing something and then never actually used it? Well, I spent a good amount of time prepping and planning a picture wall for our dining room and then never ended up using any of it. Frustrating yes, but the final product of what we ended up doing is way better than originally planned - and painfully easy. In our last home, there wasn’t a wall space big enough to put many of our framed pictures together in a large cluster. We ended up having a mini gallery in the front entrance and some in the living room. With the new house we have the space to put all of those pictures together. When it comes to home projects, I'm usually not heavy on the prep work. I want the instant gratification of the final product ASAP. I occasionally realize I need a different brush or more taping when my hands are covered in paint or something. So when I actually did all of the prep work for this project and did not use any of it, it proves that I've been doing it right all along! 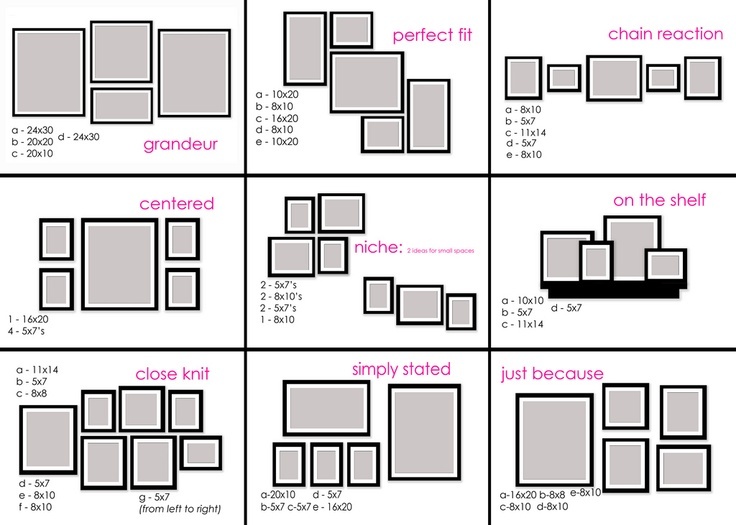 Similar to what I did by tracing and cutting all the frames. Look how much fun they are having! First, I gathered all the pictures I wanted mounted. I then used left over boxes we had to trace and cut the outlines of all the pictures we were going to use. Using paper that can be taped to the wall is much easier to visually see what the final product would look like. 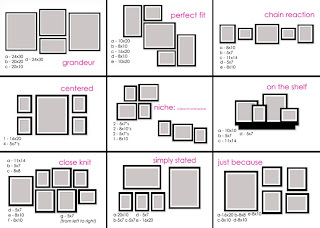 I also used inspiration for different frame layouts (see above) and then measured and laid out the different combinations to use. I did this for short amounts of time over a few days and came up with a few possibilities. And then…I saw this. This IKEA inspiration totally took all the work I had done and negated it. All my work and effort gone because we like this idea better. It also has the added benefit of requiring far less work. I went on a day trip to IKEA and purchased the Ribba shelves that came directly from the inspiration on IKEA’s website. They come in black and white and in two different sizes. I ended up purchasing two of the longer 45 ¼” versions in black for $14.99 each and one of the shorter 21 ¾” version in black for $9.99. After some quick planning we ended up recreating the idea of the inspiration photo. Obviously our pictures weren’t the same, but we really went with the idea and weren’t trying to be original. We didn’t end up using the two of our larger wedding pictures that were to go on that wall, but they ended up together over the newly painted bar table. There are still a few empty picture frames that will eventually have something. With time, the ideas for their contents will come. Our experiences in our new house, new state, new lives will help with that. Labels: Decor., Home., Ikea., Pictures.